Home More News April 5th Food Truck Friday Event! April 5th Food Truck Friday Event! 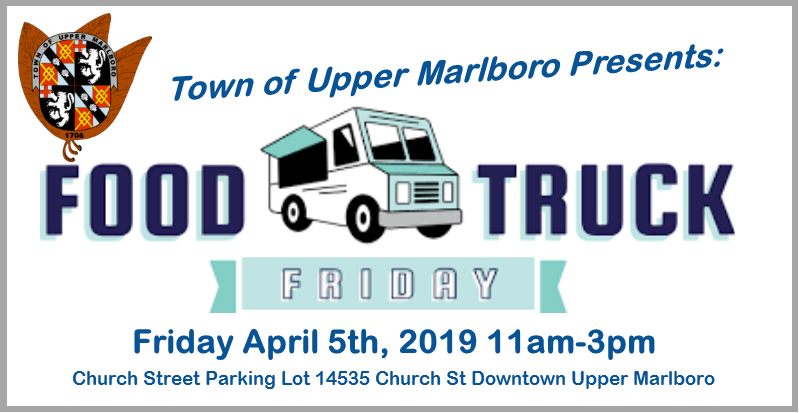 The Town of Upper Marlboro is proud to bring Food Trucks back into Downtown Upper Marlboro for the Spring/Summer months! Our next event is scheduled from 11am-3pm on Friday April 5th, 2019. Free 30min parking is available in the Lot for visitors, but feel free to walk from the Courthouse or CAB! We hope this event will help draw workers and visitors to see what food options Downtown Upper Marlboro has to offer, and why the Town of Upper Marlboro is a great place to live, play, and work!